Brilliant Nail Spa has all the top brands you are looking for in a professional nail salon. We carry OPI Gel, Essie Gel, CND, Gelish and Entity. These manicures last for about 14 days or longer. They are meant to strengthen while keeping nails looking healthy. 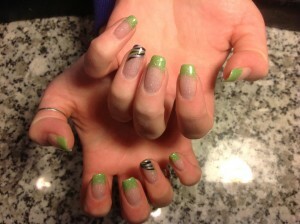 They also provide an invisible layer to protect your nails and that long-lasting color (2 weeks plus). The finish is flawless and you won’t even know it’s there! Shellac is a hybrid nail polish and gel combination. it applies like polish but gives a resilient mirror finish like gel, and will give you 14 days wear while keeping your nails strong & protected. never any filling primers & soaks off in minutes. it’s “3Free,” which means, no formaldehyde, toulene or DBP… try it & love it! Pampering Manicure plus Paraffin treatment on your hands.